So... painting the three Queens let me finally nail down my colour scheme. It’s different from what I originally intended, but much better. It has good contrast, balances dark accessories reasonably well with all the pale skin, doesn’t seem too derivative of anyone else’s work (that I’m aware of) and let’s me enjoy paiting the armour (blue grey) lighting effects (pink) and some rare highlight items (gold). Even leather is fun (black, blue, white). If that sounds odd, painting is kind of a zen thing for me, very relaxing. Painting grey is boring. Sounds wierd to say that, but, neutral greys and browns are boring to paint. Brighter colours are fun. Anyway... now I want to apply that to a unit of troops. 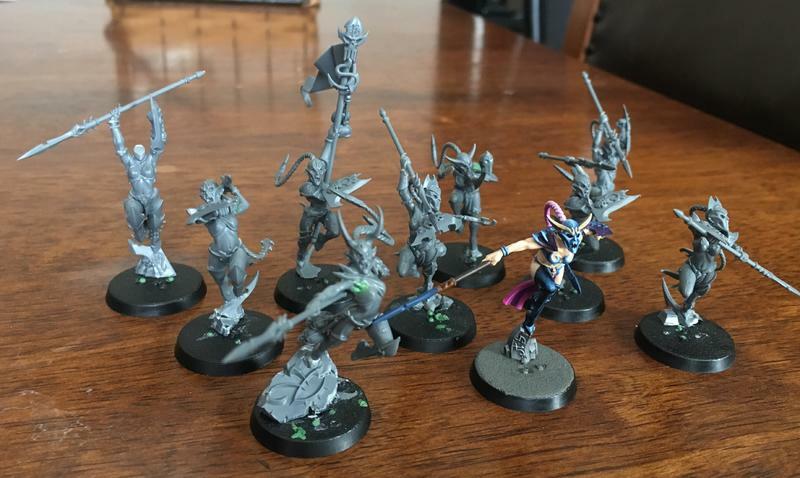 I have half-finished Doom Warlocks, an Altar and twenty Witch Elves, but want to apply the paint to clean minis. Painting my half-finished minis will get me distracted again (“hey, maybe I should keep that yellow after all!”) so I’ve packed everything away out of sight except for my Queens. Once I get the Sisters of Slaughter done, I’ll get back to the other half-finished units. Hunh. Apparently, someone lost their head in my last game. Poop. 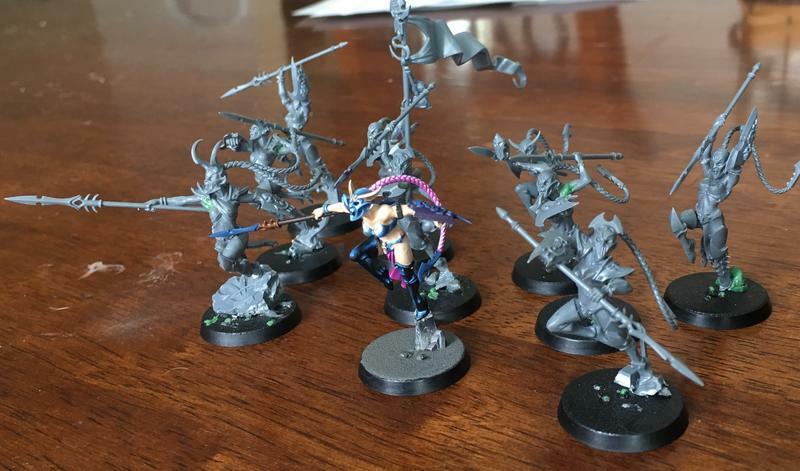 I magnetized all my models so they stay safe in my metal toolkit, but the biggest problem with Dark elf models is also their greatest appeal for me: lots of barbs and pointy bits to hook on each other. My greenstuff work was pretty hasty, I wanted to start painting last night so I had to patch up a lot of shoulder gaps where I kitbashed Khinerai arms to SoS bodies. I still need to greenstuff eyes, but wasn’t up to that last night. Ugh. I can’t remember what tool I have that was fine enough to do the eyes for the Queens. Previous entry Do hags dye their hair? Loving the dark blue/black colour! 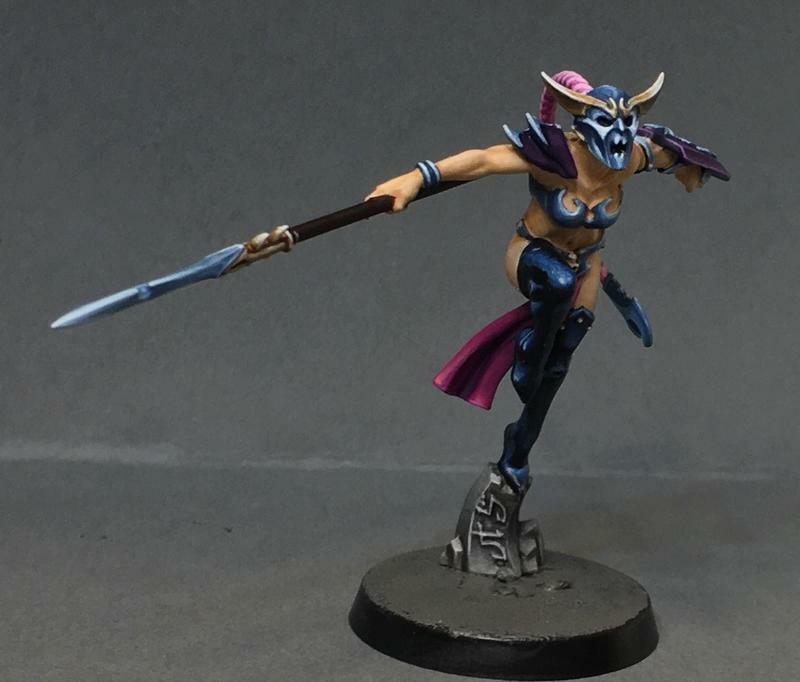 What colours did You use for that effect? Also, careful, dont get burnt out! That looks like quite some work to get finished for a horde army. Thanks! I’m really happy with the blue. It’s Vallejo Dark Prussia Blue 70899. I mostly use GW paints because I like their durability and coverage, but they aren’t very vibrant. They desaturated all their colours slighty a few years ago when they switched manufacturers. Vallejo seems to have smaller pigments, and blends smoother. I’ve been adding a couple drops of the Dark Prussian Blue into my GW blue-grey paints that I use for the armour, to add a little colour. Okay, one down, nine to go. I’ve been using my medicine cabinet as a lightbox. Kinda’ works, so I thought I’d try a coloured backdrop so the camera doesn’t try to pick a white point from the background. I think I need one more layer of highlights for the skin, looks a little flat in the photo. How do you do your blending? It looks great. I struggle with blending the fairer skin tones - the whites are so streaky compared to painting red or green. Do you lay it on thicker then feather with a wet brush? Or do you just mix on a wet pallette and go up the spectrum? Also curios about your color choice. I’ve been starting at rakarth and moving up to pallid wych (I think? It’s close to white) and I’ve been OK with it but am keen to try other variations. I find adding the pinker tones to be tricky to get right. 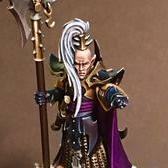 The consistency of GW’s fleshtones is pretty awful. I use lots of thin layers of watered paint to get a smooth finish... between five and ten coats just for the base skin tone. It’s pretty slow, unfortunately, but the end result is worth it. I tried a few different skin options, and in the end I just used Kislev flesh and white. It’s pale, but healthy-looking, and seems to contrast well with the blue and pink in their outfits.